Autumn has arrived! 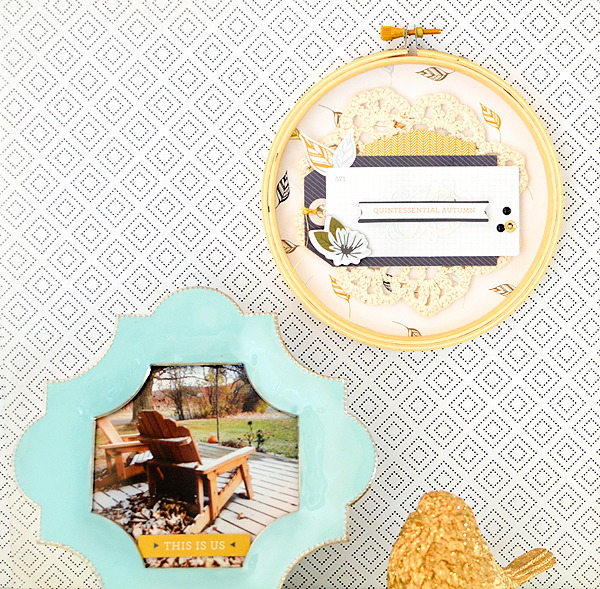 Do you love the fall or see it as the precursor to the long, dreary winter months ahead? I think I kind of love it! It's very strange, actually, autumn in Southern California, because the first few weeks are usually hotter than all of summer. I miss autumn in (upstate) New York--the smell of the grape harvest, taking long scenic drives along country roads to see the spectacular fall foliage, apple cider and donuts from the local apple orchard--that is, as the picture states, "quintessential autumn." 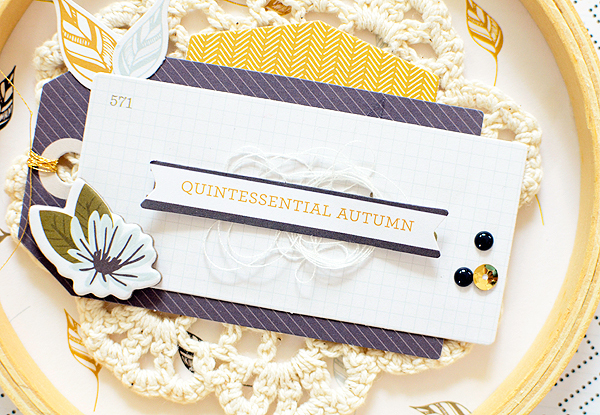 Beginning this month, Gossamer Blue is manufacturing their very own collections of scrapbooking paper and embellishments. It's pretty exciting news over there and a few of the DT members were lucky enough to have the first crack at the new stuff. I got to try out the Gramercy Road line by One Little Bird (for GB). It's fall-themed, but versatile enough to be used year round. The patterns of paper are mostly neutral and "petite"--by which I mean that there are few sweeping, giant strokes or designs. They are not bold, they are not showy. But they are modern and graceful and play very, very well with others. The colors are serene and soft--charcoal gray, baby pink, pale aqua, taupe, navy--accented with a couple of louder surprises--marigold and chartreuse. 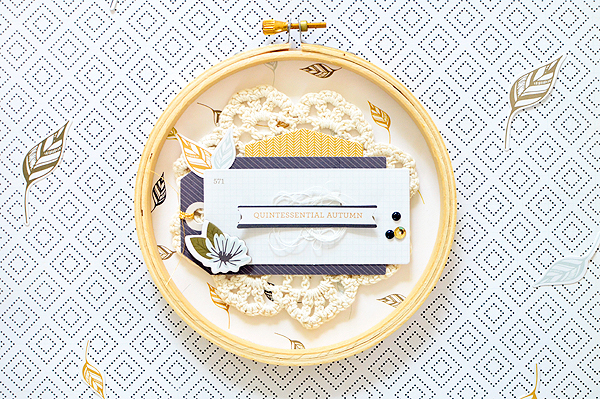 The collection features assorted patterned paper, die cut ephemera, die cut leaves, chipboard stickers, labels galore, enamel dots, tags, and a really nice stamp set that I can't wait to use! There's probably even a few items I forgot to mention so be sure to check out the collection in it's entirety. Rumor has it that it will be for sale very soon! *I must add that the black and white diamond paper seen as my backdrop here is not part of the Gramercy Road collection--although it would fit in seamlessly. It's actually "Memo" from Crate Paper's Notes & Things. It's become my go-to background, in case you hadn't noticed. I guess I should say a little about the project...I wanted to make something cozy and fall-ish. Since I always get reminiscent this time of year, I thought I would make something as an ode to all of the crafty ladies in my family--my mother, my aunt Connie, and my grandmothers. The hoop signifies the dozens upon dozens of embroidery pieces they've each made. And the doily--made by my great-grandmother-- helps my home decor project achieve the warm, homespun quality I was hoping for. I paired it with the picture of the adirondack chairs on my parents' deck because, as I said, autumn in New York, for me, really is the epitome of the season. I took the photo last November when we were visiting right after my mother died. There was just a bit of snow covering the leaves on the deck but the sun was shining on the chairs and it looked so pretty. I know she sat out there every summer afternoon and read and I wanted to capture the memory of her favorite spot. I think she'd be pleased.